Donations to bike camps are always welcome! All donations are tax deductible. The Friends of Hank Aaron State Trail and its supporters have sent over 1,000 neighborhood kids through Bike Adventure Camps since 2008. 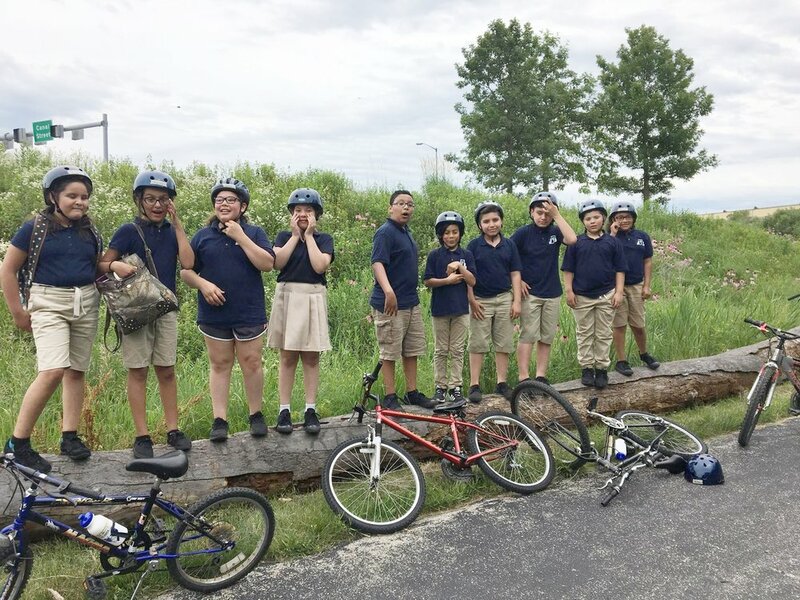 In 2017, students from four schools and a community center near the trail participated in the camps designed to introduce children between the ages of 10 and 13 to biking and exploration of the Hank Aaron State Trail. The Hank Aaron State Trail passes through the City of Milwaukee's most densely populated and diverse census tracts. The Trail is within a 15 minute bike ride of over 415,000 people, of which 100,000 are children ages 18 and under. These adjacent neighborhoods are also home to some of the most at risk for childhood obesity, juvenile diabetes, asthma, and a myriad of other health issues. To help address these issues, FOHAST began to offer free summer Bike Adventure Camps in 2008. The purpose of the two-week camp is to educate youth in safe biking habits and to encourage use of the Trail by the kids and their families for recreation and improved health. FOHAST partners with neighborhood schools, where 20-25 kids, ages 10-13, participate with bikes, helmets, and water bottles provided. Professionally trained instructors from the Wisconsin Bike Fed provide training that goes from the classroom to neighborhood streets and finally to the Trail. Rides progress in distance while introducing destinations such as Miller Park, Lake Michigan, Pettit Ice Center and the Soldiers Home Historic District. For some youth, this is their first time on a bike, and may even be the first time they have seen Lake Michigan. In 2014, a nutrition component was developed by FOHAST board member Dr. Judy Springer from Milwaukee Area Technical College. Campers engaged in mini lessons on healthy eating and enjoyed healthy snacks during riding breaks. I liked bike week because we can get active and see nature. Organizations and schools interested in sending their children to a FOHAST Bike Adventure Camp should contact us.